Cherry Mobile drops a four-fold of new devices in a single Cosmos line on their Bigger and Brighter event yesterday. These new kids on the block are Cosmos X, X2, S and Z. The features that define these siblings are the whooping 18MP BSI camera, a hefty quad-core CPU and a gigabyte of RAM. 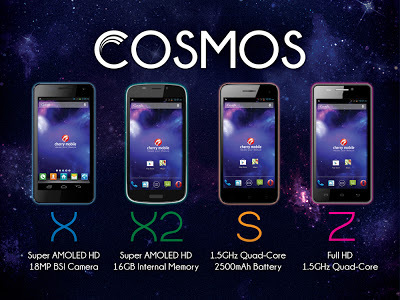 Both Cosmos X and X2 phones packed in a Samsung-ish Super AMOLED HD display which makes the local fruit player to be the first one to produce a local SUPER AMOLED phone. 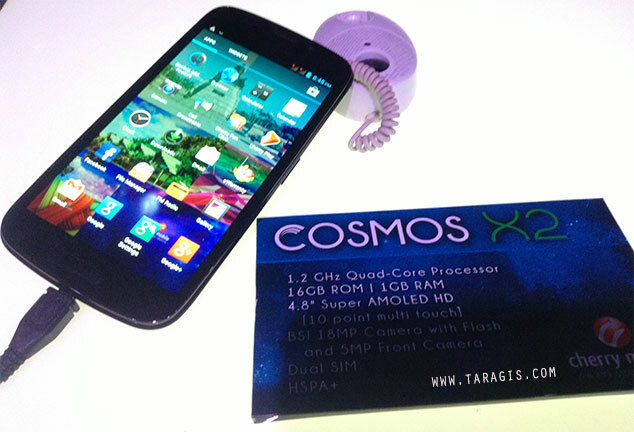 The Cosmos S comes in with a humble HD display while its bumped up brother, Cosmos Z, will have a full HD display. Yes, Cherry Mobile scores again for the first local Full HD phone. All phones will be powered by a MediaTek processor and PowerVR GPU. Aside from that, they will have their respective configurations in 4GB, 8GB and 16GB interbal storage. More details will come after the jump. It is exciting to see how the local tech continues to grow with every prodigious releases and Cherry Mobile is nothing short of that. Every product launch continues to be exciting for us who breathes and eats mobile devices. You can also check out Taragis.com's hands-on video here.